The verdant trees which were all around us were just so refreshing. Seeing everything in green is such a relief. I can say that the scene and all the elements of nature gave me a boost of happiness. I have been thanking God that He gave us nature, not only to relax and enjoy, but for us to think of His great love towards us. Location: Mt. Kitanglad Range Natural Park, ASEAN Heritage Park, Cinchona Park/ Forest Reserve, Kaatuan, Lantapan, Bukidnon, Philippines. Access Point: Aglayan Highway, 28 km. That day, it appeared like it was about to rain in the morning but the weather cooperated throughout the day. It was not so hot and not raining either. From Aglayan, our GPS informed us that we need to travel 28 km to reach there. We had a private car and road was good and cemented. We passed by Kulasihan, Lantapan and then finally reached Kaatuan. Upon arriving at this signage, you need to turn right which would mean 8 km more in order to reach the forest reserve. The road is not cemented going there but it’s not bad. Thankfully, we didn’t encounter problems with road or engine. Going up, you can really notice the change in temperature. It’s cold and the oxygen-filled air was just so refreshing. We passed by the forest with the main road on it. Both tall and small trees greeted us. We finally arrived and we went directly to the reception area. We were told that we need to get a permit first from the Malaybalay DENR office or from the Barangay of Lantapan which would cost us 100 pesos each person. Thinking that this might be hard on our part, considering the time left, we asked for any alternatives or other negotiations. We were told that the one in charge can process the permit for us and allow us to get in. We paid 50 pesos per person. Needless to say, we accepted the offer which was very fair enough. Though officially named as Mt. Kitanglad Range Natural Park, the place is also known as Cinchona Forest Reserve/Park. I just knew later on that the word Cinchona actually refers to plants that are characterized as large shrubs or small trees with evergreen foliage. I haven’t remembered seeing them though when I was there. When a forest is declared as part of ASEAN Heritage Parks, this means that it is an “existing protected areas of the ASEAN member countries which have been recognised as regionally important based on their conservation value”. This means that they are protected areas of high conservation value, unique, diverse, outstanding regionally and internationally. There are 35 ASEAN declared heritage parks and reserves. 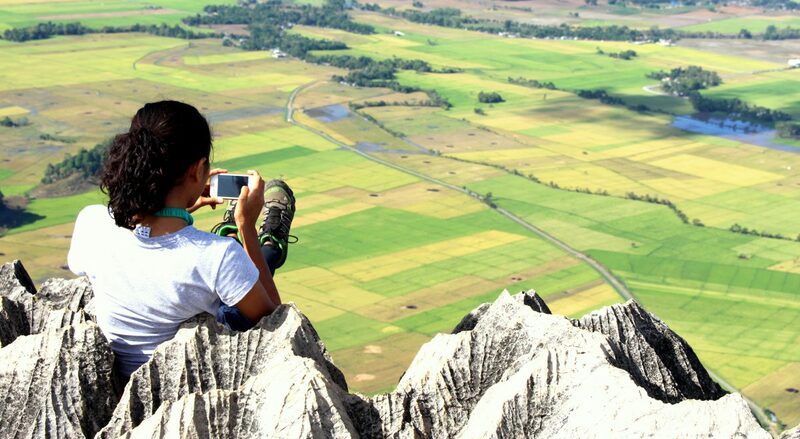 Out of the 7 heritage parks in the Philippines, Mt. Kitanglad Range is one of them. For a list of the ASEAN Heritage Parks, kindly click this link. Just on our right side is the Biking Trail. They have no bikes to be rented though so you may bring your own bike if you like to try this activity. Going farther, we saw a small bridge with bamboo trees. The place is really photogenic. We went up in order to go back to the area. We passed by the hall where people can pitch their tents. We also reached the landmark area. On our left side is a building and on the right side is a white American house where people can also be accommodated. The place can actually be rented for camping activities. We went directly for the Canopy Walk which we anticipated from internet reviews.This can be accessed through the hanging bridge. It was a bit frightening at first but the beautiful sight melted all the fright in me. We were hesitant to walk at first at the bridge but the inviting scenery has drawn us. The Canopy Walk is accessed through the Hanging Bridge. The verdant trees which were all around us were just so refreshing. Seeing everything in green is such a relief. I can say that the scene and all the elements of nature gave me a boost of happiness. I have been thanking God that He gave us nature, not only to relax and enjoy, but for us to think of His great love towards us. Peaceful. Calm. Scenic. These are the words I can think all the time. Tip: If you happen to visit a forest, never forget to do deep breathing. This helps you well with your oxygenation in your body especially your brain which is very beneficial to you. This can also take away depression and stress. We enjoyed as much as we can during our Canopy Walk– from walking, doing jump shots, sleeping in the bridge as if it was a hammock, sitting, posing and it was just a great time to enjoy nature with friends. Though the cable is strong, safety should always be our main concern. It may be hard for a person to fall here unless if he really wanted to; but your small things like your cellphone may fall and pass through the 2-inch sized gaps in between the bridge if you are not careful. After our experience with the Canopy Walk which we can’t really get enough, we headed right away to the Picnic area for our lunch. Cool breeze+great company+healthy food=hearty lunch! “He shall be like a tree.” Psalm 1:3. The Bible likened a righteous person to a tree. In this forest, needless to say, I have seen different kinds of trees in different sizes and looks. God created the trees to remind us of its spiritual value. The tree exemplifies well a well-ordered life which is a life lived in love, honored by God and man. As one observes the trees, one can see that the trees look upward and reach upward. They get all the sunlight that they can, seeking to live where the air is clearest and the conditions are best. Also, they bear fruits which usually grow at their top part (Family Bible Lesson, Y1Q1, p.9). These though-provoking observations made me realize certain areas in my life. Am I like the tree looking upward and reaching upward or am I focused on myself only? Is my life a well-ordered one which glorifies God and blesses men or is it a life that needs a lot of pruning and straightening? Am I getting all the light that I can from the Sun of Righteousness or am I contented in darkness? Am I bearing best fruits (which are at the top part symbolizing the highest character I can attain) or I am contented with mediocrity? I know the answer is in my hands. Life is journey with Jesus only. You don’t want to miss Part 2 of the Cinchona Park Escapade which includes the Waterfalls Trek. Part 3 of the Cinchona Park Escapade which includes the Hug-a-Tree Campaign.